“Love Is…” includes three talking characters who offer us perspectives on life in relationship to love and what it reflects on a daily basis. A one person tour de farce exploring, explaining, and exemplifying concepts of the disturbing subject of LOVE. Tools used to explore are: Poetry, music, masks, songs, and movement. Not Realism, not Naturalism, not TV. Something quite different, entertaining, and surprising. 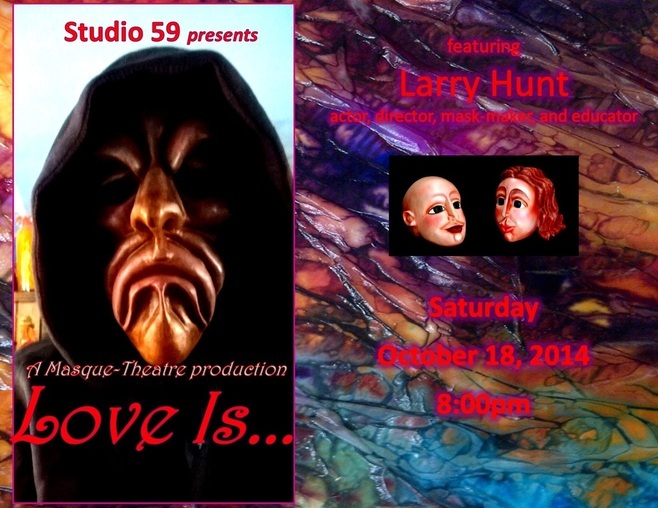 Larry Hunt is an actor, director, mask-maker, and educator. During the past 30 years, he has performed throughout most of the United States, Canada, and many other countries including China, Japan, Australia, Poland, Denmark, Finland, Israel, Bulgaria, Serbia and England. by ZeAmi to Peter Brook. 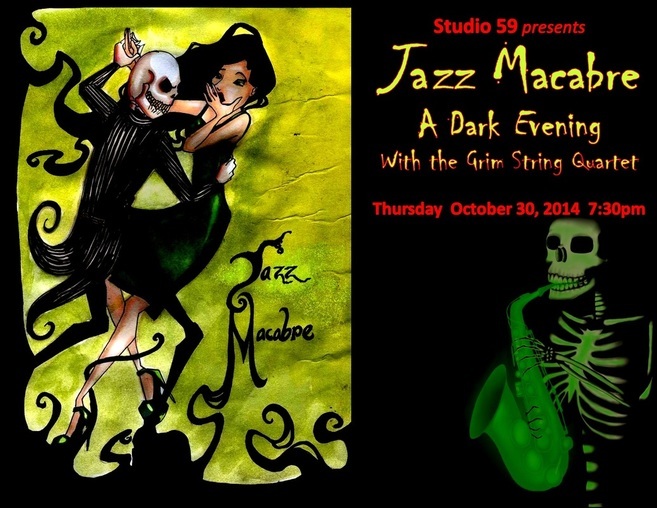 "Familiar themes from Halloween, played in the style of Gypsy swing." The Grim String Quartet performs familiar themes associated with the Halloween season in the style of French Gypsy Jazz. 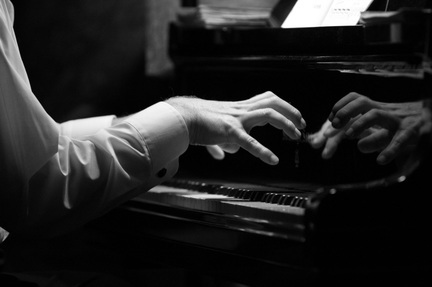 Classic compositions like Chopin's "Funeral March", or Saint-Saëns' "Danse Macabre" are interpreted and performed as jazz standards with an air of holiday mischief. 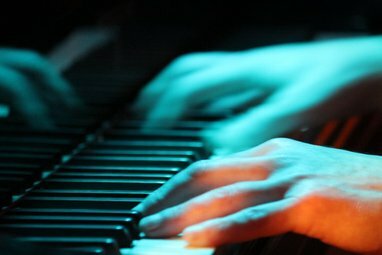 The group consists of talented regional musicians who bring years of improvisational experience to a unique musical program that is sure to raise your spirits. 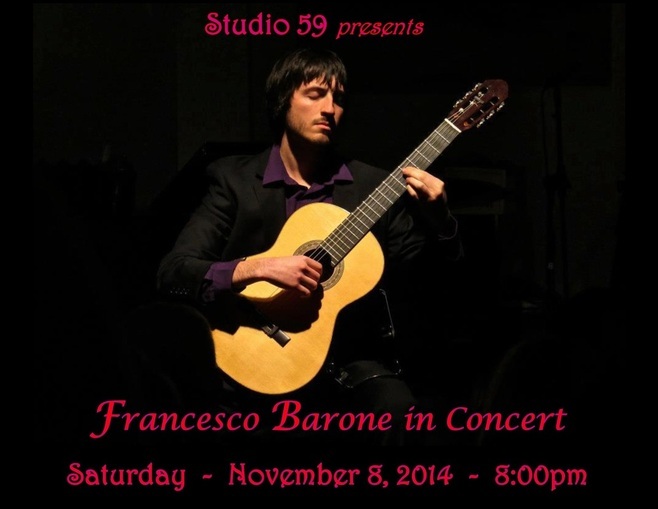 ﻿Award winning guitarist Francesco Barone has performed throughout the Northeast United States and internationally as a soloist and chamber musician. He has been presented on concert series including Concerts@Capital, Assumption College and the New England Guitar Society. Mr. Barone was also featured on a La Bella Strings sponsored concert in which he was a featured artist. He has also performed with Performance 20/20, the Hartt School of Music’s honors chamber ensemble and has had his music broadcasted on National Public Radio. Mr. Barone was a prizewinner in the 2009 Philadelphia Classical Guitar Society Guitar Competition. He received his Master of Music from and is a current DMA candidate at The Hartt School where he studies with noted pedagogue Richard Provost. In addition, he holds a Bachelor of Music from Temple University in Guitar Performance where he studied with Allen Krantz. He has performed in numerous masterclasses with world-renowned guitarists including Manuel Barrueco, Oscar Ghiglia, Scott Tennant, Jason Vieaux, Ana Vidovic. Elena Papadreou and Antigoni Goni. 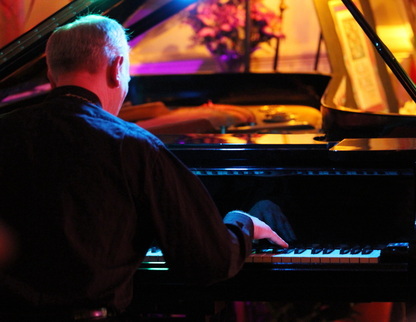 Mr. Barone resides in Hartford, Connecticut and maintains studios at Capital Community College, Capital Preparatory Magnet School and the Hartt Community Division at the Hartt School. 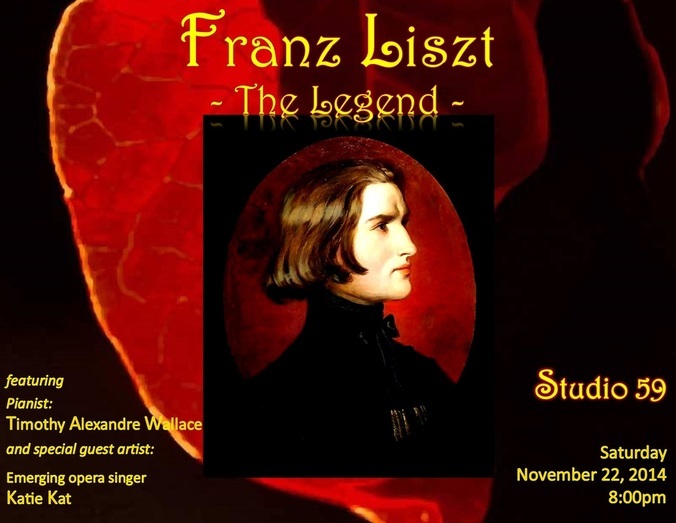 Franz Liszt (October 22, 1811 – July 31, 1886), was a 19th-century Hungarian composer, virtuoso pianist, conductor, teacher and Franciscan tertiary. Liszt gained renown in Europe during the early nineteenth century for his virtuosic skill as a pianist. He was said by his contemporaries to have been the most technically advanced pianist of his age, and in the 1840s he was considered by some to be perhaps the greatest pianist of all time. Liszt was also a well-known and influential composer, piano teacher and conductor. He was a benefactor to other composers, including Richard Wagner, Hector Berlioz, Camille Saint-Saens, Edvard Grieg and Alexander Borodin. 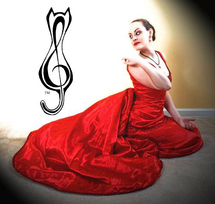 ﻿Katie Kat is an emerging opera singer and self made ‘Opera-preneure’. She was a NYFA Entrepreneur Bootcamp Scholar in 2012 for her work producing operatic recital performances for arts venues and private events. She has performed at The NYU Skirball Center, Lincoln Center’s David Rubenstein Atrium, The Teatro Caio Melisso in Spoleto, Italy, and is currently a featured performer with the off-Broadway show Speakeasy Dollhouse. A voice teacher and researcher; she recently gave a TEDx Speech on the necessity of singing, and makes it her mission to make opera accessible to all audiences. The spirit of the horse is recognized to be the Chinese people's ethos – making unremitting efforts to improve themselves. It is energetic, bright, warm-hearted, intelligent and able. Ancient people liked to designate an able person as 'Qianli Ma', a horse that covers a thousand li a day (one li equals 500 meters). They are popular among friends, active at work and refuse to be reconciled to failure, although their endeavor cannot last indefinitely. They cannot bear too much constraint. They are usually impatient and hot blooded about everything other than their daily work. They are independent and rarely listen to advice. Failure may result in pessimism. They usually have strong endurance but with bad temper. Flamboyant by nature, they are wasteful since they are not good with matters of finance. They tend to interfere in many things and frequently fail to finish projects of their own. 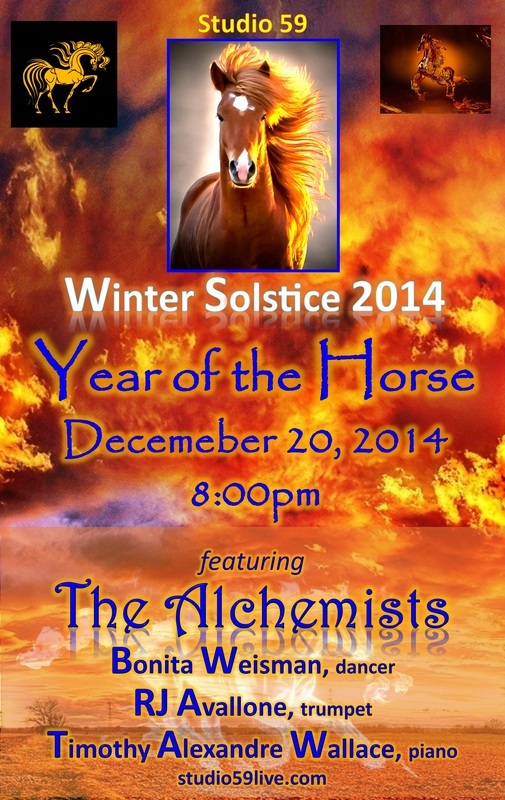 Horse people are active and energetic. The horse is very quick-witted and is right in there with you before you have had the chance to finish what you are saying: he's onto the thought in your mind even before you've expressed it. 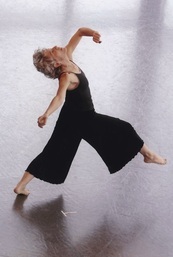 Bonita Weisman has been teaching, performing and choreographing in Hartford since 1983. Growing up in Manhattan enabled Bonita to study with such notables as Bonnie Bird, Mary Anthony, June Lewis, Louis Falco, James Truitt, Carol Fried and Simone Forti. Although she danced at SUNY Purchase, she received her BA in literature. In addition to dance technique, Bonita’s training includes studies in dance therapy, expressive therapy, Laban Movement work and folk and social dance styles. 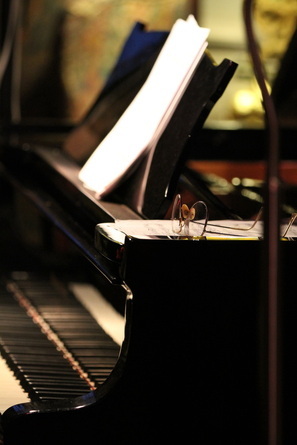 In the Hartford area, she has taught at Connecticut College, Trinity College, the Performing Arts Academy and the Hartford Conservatory. 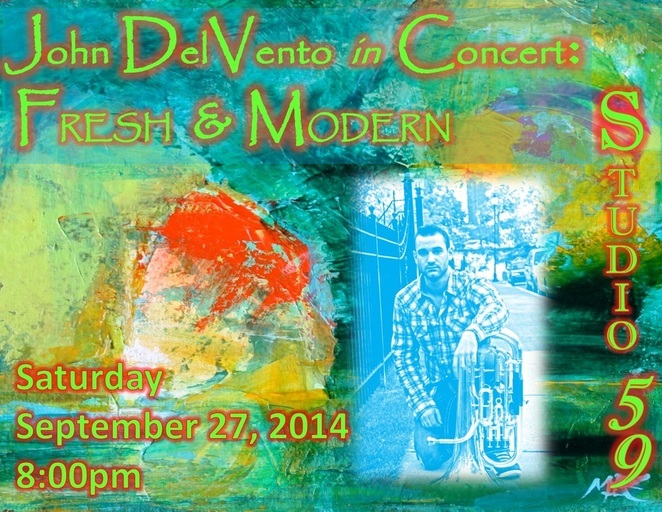 Currently Bonita is an adjunct professor at the Hartt School of the University of Hartford. Bonita’s main focus is improvisation and creative process. She has been facilitating a movement jam called, “Don’t Come Prepared” for 25 years. In recent years she has found herself playing freelance rubboard with several zydeco bands. When she is not dancing or playing she is busy helping others on their path to wellness as the owner of West Hartford Massage Therapy. RJ Avallone - Musician, composer, painter, and educator, RJ Avallone was born September 23, 1980 in Torrington, Connecticut. He came up through the Torrington Public School’s music program and was the first student in town to study at the Greater Hartford Academy of the Arts. He was a full scholarship student at Berklee College of Music in Boston where he performed with the school’s most prestigious ensembles, including the faculty big band. As a freelance trumpet player, RJ has performed with Patti Austin, Michael Buble, Natalie Cole, Bobby Short, Charnette Moffett, WDR Radio Big Band, Joe Lovano, and a host of others. He has performed all over the world in venues such as Lincoln Center, Newport Jazz Festival, Litchfield Jazz Festival, Tanglewood, MGM Grand (Las Vegas), Birdland, The Waldorf-Astoria, Boston’s Symphony Hall, and more. 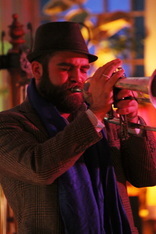 RJ spent 3 years studying extensively with jazz legend and Pulitzer Prize-winning multi-instrumentalist Ornette Coleman. His recording credits include: Charnette Moffett’s Art of The Improviser, Gilad Ronen’s Project Grand Slam, and Mike Roots’ Unity Riddim Sessions Vol. 1. He co-leads the group Search, whose debut release Today Is Tomorrow has received very positive international reviews and radio play throughout the US.